We love the creativity surrounding the vibrant Arts & Crafts market in the UK, so we were very proud to be asked by Crafter’s Companion to develop a website for their range of craft pens/markers, Spectrum Noir. 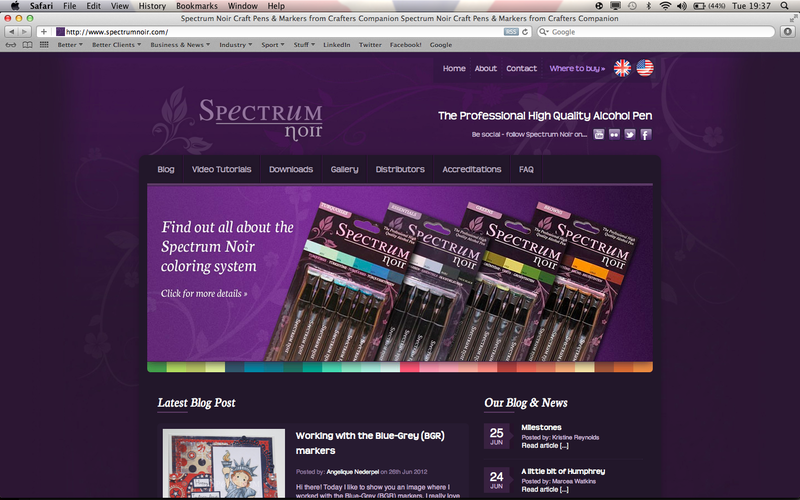 The website, now live at www.spectrumnoir.com, features a rich hub of information, video tutorials, downloadable resources and photo gallery as well as directory of UK and US distributors. Spectrum Noir pens are a must-have for any serious crafter who likes their coloring – especially rubber stamping enthusiasts! The markers are alcohol-based, acid-free and fast drying, which means they won’t bleed. Spectrum Noir marker pens are avaiable in 168 colors which can be mixed on the surface, or layered over each other for professional blending. We’re recruiting: Account/Studio Administrator to join the Better team.